Sometimes mistakes in the kitchen turn into something great. I stayed with some friends recently and I took it upon myself to buy a few breakfast items to cook in the morning as a reward for putting up with me for the night. My plan was omelets. The last thing in the skillet were the eggs and through my impatience I kept stirring the mix which scrambled them. 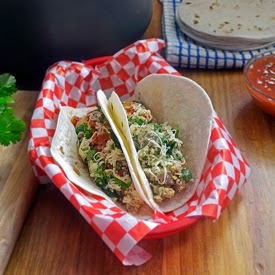 Instead of a thick omelet like patty in the skillet I got a breakfast scramble that was perfect for a burrito or taco filling, but a little awkward to eat with a spoon from a bowl instead of wrapped in a tortilla with toppings. My friends agreed I had the start of a great breakfast taco. For this recipe, I remake my breakfast blunder with some small tweaks. Sausage is the key element of flavor and it’s complimented by the sauted vegetables. The eggs add a fluffy and creamy texture. 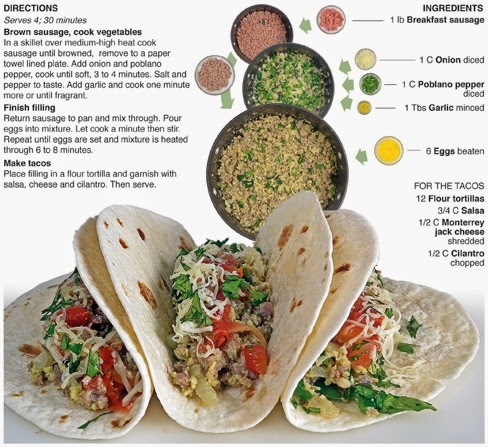 Salsa, cheese and cilantro are used as garnish and it’s served on a tortilla, helping turn a mistake into a great way to start the day. 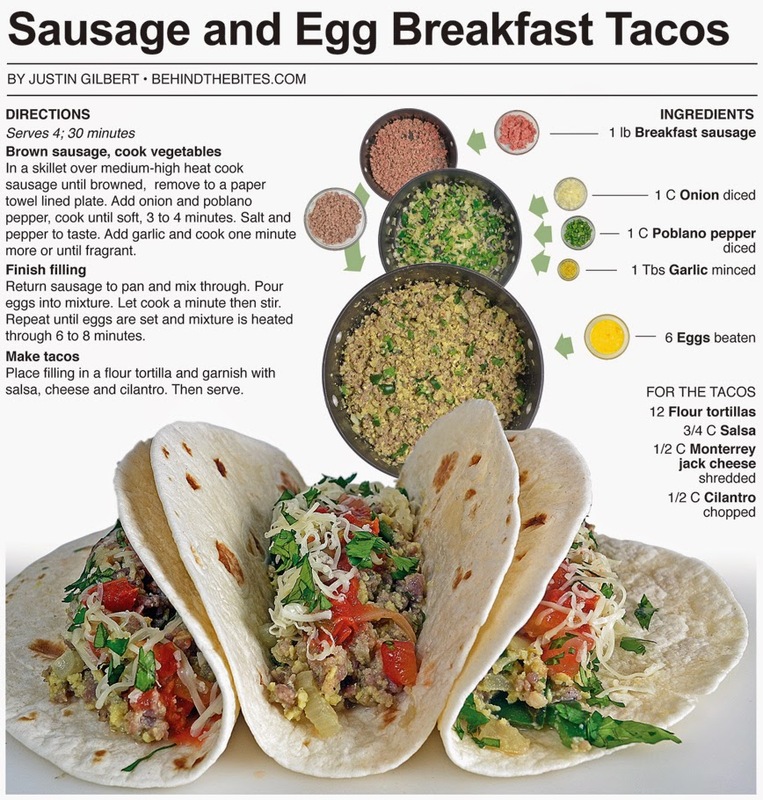 I love turning tacos and burritos into breakfast items, which had always left me to dream about Taco Bell offering a breakfast menu. Well, that culinary dream has come true and last Thursday I ventured to my nearest Bell for a breakfast sampling. I ordered a Waffle Taco and an A.M. Crunchwrap with steak. 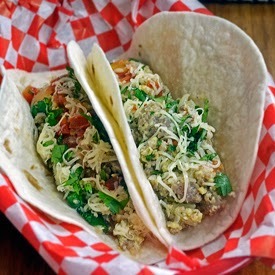 The taco had a manufactured flavor about it and I thought it could be reworked to make a little tastier. The waffle had a syrup flavor infused in it and made it taste unnatural. The A.M. Crunchwrap was simply spectacular and the best thing I have ever eaten for breakfast at a fast food chain. The hash brown, steak, eggs and cheese packaged into a toasted tortilla is an excellent breakfast item that can be eaten on the run. I really think the hash brown patty included in the mix really helped it stand out. I used a little mild salsa with each bite also. They have a sausage and bacon option for the A.M. Crunchwrap and I plan to try them both next time I make a run for the border before 11 a.m. In a skillet over medium-high heat cook sausage until browned, remove to a paper towel lined plate. Add onion and poblano pepper, cook until soft, 3 to 4 minutes. Salt and pepper to taste. Add garlic and cook one minute more or until fragrant. Return sausage to pan and mix through. Pour eggs into mixture. Let cook a minute then stir. Repeat until eggs are set and mixture is heated through 6 to 8 minutes. Place filling in a flour tortilla and garnish with salsa, cheese and cilantro. Then serve.